According to the calendar, late winter should be in full command across much of the country, though a mild run of weather conditions would seem to indicate otherwise. Meaning that if it hasn't already happened, spring is about to be sprung. And that's good news to bass anglers cooped up with cabin fever all across the nation, fishermen eager to get after the big bass sows soon to be heading shallow for the spring spawn. But in an angler's rush to get out onto a local big bass water, Major League Fishing cofounder Gary Klein cautions fishermen not to put the horse in front of the cart, so to speak. "Sometimes, we have these really nice warm periods and we start fishing ahead of the fish," said Klein. "It gets warm out and we think that the bass are already up shallow when they aren't quite there yet." Klein reminds anglers while the late winter air temperature is an important consideration for most anglers – when it's comfortable, we want to go fishing – springtime bass angling is really all about the water temperature. "The water temperature is what I spend most of my attention on at this time of the year," said Klein, a Bassmaster Elite Series legend with 30 Bassmaster Classic appearances to go along with eight career wins on the B.A.S.S. tournament trail. "What's really important is not just the water temperatures during a sunny day, but also those temperatures at night," he added. "I'm looking for water temperatures that are 47, 48 or 49 degrees in the morning and starting to rise." When Klein finds that, he knows that a period of good late winter or early spring fishing is often not far behind. "When you get a warming trend (at this time of the year) with air temperatures threatening to go into the 80s – especially when the water temp has been 49 or below for a month – then all of a sudden, it (the water temperature) jumps up (into the lower 50s and beyond)," he said. When that happens, "... the fish are starting to think about it." Even so, Klein reminds anglers that despite the mild weather in some areas, "... as far as the spawn goes, everything is controlled by Mother Nature and the bass' eggs still have to develop (in a lot of places)." With the increasing photoperiod and the approach of the dark of the moon and full moon cycles of late winter and early spring, the spawn is quickly approaching go-time from a biological standpoint. But the usual meteorological parade of alternating warm spells and cold fronts will also serve to influence how the bass fishing actually goes on a particular body of water on any given day. For that reason, Klein says to focus intently on the current conditions, not what was going on a few days ago. "When you go to a body of water, you've got to do your best to get dialed in to what is going on right now," he said. 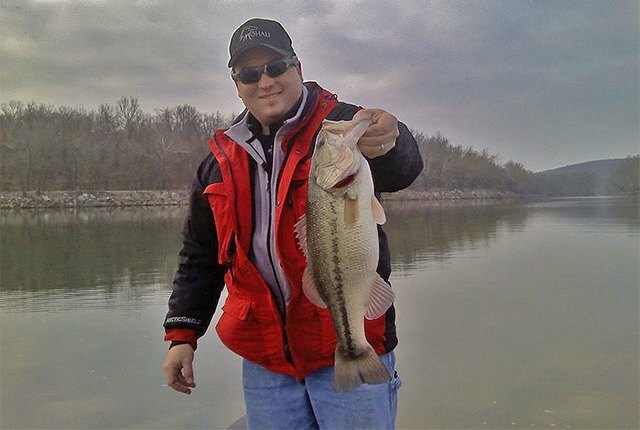 To do that on the various lakes around Klein's home in Weatherford, Texas, there are a few things in particular – in addition to the water temperature – he will start looking for as he searches for bass staging up in the late prespawn period. "I will pay attention to everything that is isolated from the wind, especially a north wind," he said. "I'm looking for areas where a south wind will warm it up. "On a lot of lakes around Dallas/Fort Worth, you'll find a number of coves exposed to a north wind," added Klein, the 1989 and 1993 B.A.S.S. Angler of the Year. "That's not something that I'll want to fish (right now). What I'm looking for are places that are closed off from north wind and probably exposed to south winds which can warm the water up (quicker)." When Klein locates such a spot where bass are situating themselves in preparation to move shallow, he knows that he doesn't have to worry too much about bait selection right now as he does at other times of the year. "What is so exciting about this time of the year is that you don't have to get too finessy with the fish," said the Texas pro who narrowly missed winning the Major League Fishing stop at Lake Ray Roberts a few years ago. "During the prespawn, especially in these warmer trends, you can target bass with bigger baits," he said. "At this time of the year, you typically don't have to jack with the little baits because they want something that moves some water around." "The fish are starting to think about coming in to spawn and they are feeding up and are very territorial," said Klein. "They start killing all kinds of critters that come into their strike zone, pretty much whatever they can. "And down through the years, it seems – to me at least – like they eat bigger baits better right now than they do after the spawn." This means you'll find a selection of five Duckett Fishing rods on the front deck of Klein's tricked out Triton boat, power-fishing rods and not the finesse stuff that comes into play later on in the year. And attached to the fishing line at the end of those rods will be such lures as a big single-bladed Colorado style spinnerbait; a 1/2-ounce black/blue jig with a Chigger Craw on the backend; a red lipless crankbait; a squarebill crankbait; and believe it or not, a buzzbait. The bottom line for Klein right now at the end of wintertime is that the best fishing of the year might not actually be at hand just yet on a nearby lake or reservoir, at least not in terms of numbers. But that top-end fishing usually isn't too far away either as winter begins to fade towards spring. And besides, even if the overall daily numbers game isn't as good right now as it will be in the very near future, the chance to stick a real giant is always there in the late winter prespawn as bass stage up to go shallow. "This is the time of the year where numbers aren't very high, but the quality (usually) is," said Klein. "You might fish all day long for just three or four or five bites. "But one of those bites might be a really big fish." A Texas-size lunker, the kind that helped lure Klein to the Lone Star State from his native California a number of years ago. The kind of fish that can make an angler famous on the Internet fishing boards, if not helping them to win big bass honors at an early season tournament. And the kind of fish that Klein has made a legendary career out of catching, fish that have propelled him to develop a Hall of Fame resume in a career that shows no signs of winding down just yet. Because for Klein, there are still more goals to achieve in professional bass fishing – like winning a MLF Summit or Challenge Cup – and there are still more big fish to be caught, big bass that he can hold up high for the television cameras to see. And that's plenty of reason to lure Gary Klein out onto a North Texas water body right now as El Nino ushers in an early spring.